Rarely do the forces of nature, human vision and artisanal craft conspire to create something radical. "The Okanagan Valley is a magical place to grow and produce world class Pinot Noir"
- Gregory V. Jones, PhD. Wild. Elusive. Welcome to the northern part of British Columbia's Okanagan Valley, one of the most breathtaking places on our planet to grow grapes. Ancient volcanic and glacial soils settle amongst precipitous hillsides. The area is blessed with warm days, cool nights and the lowest rainfall and humidity of any wine-producing region. Our unique latitude and altitude conspire to yield a dramatic viticultural landscape which produce intense and balanced fruit. This is winemaking on the edge. Striking. Rugged terrain and a pristine, deep lake define our region. The Okanagan Valley, British Columbia is the wine world's best kept secret. Here, latitude and altitude synthesize to form something truly unique. Intense. The warm and dry climate is optimal for the Pinot Noir and Riesling that we grow. This is a desert in the rain shadow of the Cascade/Coastal Mountains where the weather is extreme. Warm days, cool nights and bone dry harvests with vast daily temperature swings and penetrating light. This is an austere yet rewarding place to grow magnificent fruit. "The main control on the ability to grow quality wine grapes in any global region is climate. 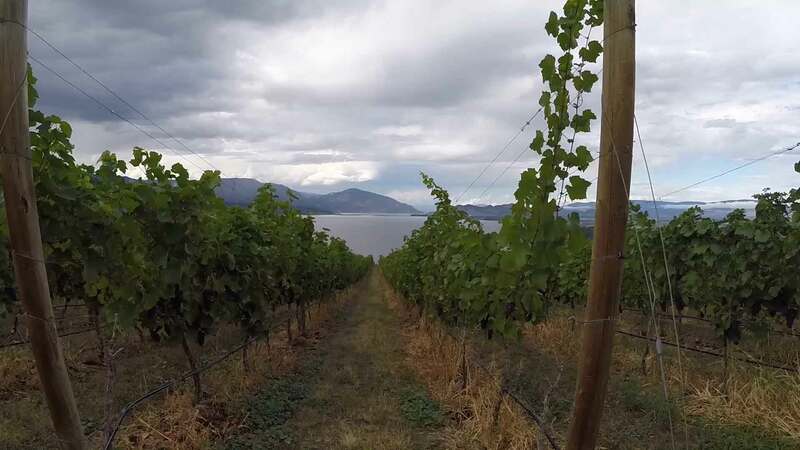 Varieties such as Pinot Noir for example produce best when grown in cooler climates like the Okanagan Valley while others do better in warmer climates." Challenged. Our narrow and steep hillsides were created over 50 million years ago. Volcanic in origin, and then carved over millennia by glacial activity. The land is wild, granite-strewn and laced with quartz. The soils are wind blown and sparse. All of this imparts depth and character to the wines. "Even coming from New Zealand, the landscape and intense environment here took me by surprise. I thought to myself that wines from this area could truly be remarkable." The Simes Vineyard is a uniquely north-facing with granite-based soils, both making it quite marginal and challenging. This leads to cool, fresh and bright aromatic characters in the wines. The Vineyard is heavily sloped with Pinot Noir at the top and Riesling (the last parcel picked every year) at the bottom. One of our hidden treasures. No place better exemplifies the quote "Pinot likes to grow in beautiful places". Breathtaking beauty, dramatic landscape and substantial elevation change. This is our most climatically and geologically diverse site. Red granite rock is literally on the surface above granite bedrock, with no grass or cover crop. The boniness and grit challenge our vines to reach extraordinary levels. This is the site of our oldest and gnarliest Riesling vines, along with five stunning distinct blocks of Pinot Noir settled in a variety of separate micro climates. This tiny vineyard comprises one single parcel right at the foot of a dormant volcano. White rock, including quartz form the bedrock, imparting a distinctive minerality in the wines. Named after Anthony von Mandl's year old mother, this heritage block faces south east, creating a sun sink which encourages intense fruit that is remarkably challenging to pick, but it then rewards us handsomely. Intuitive. Detail-obsessed. Shane Munn has extensive winemaking experience from regions all around the world. From his native New Zealand, to Burgundy and Barolo, as well as North America, this experience offers both breadth and depth to his thinking. Shane embraces the art and authenticity of wine, which he marries with a strong analytical background (degrees in both mathematics and winemaking), focusing on the most minute details in the vineyards and the winery. A bit of an enigma, Shane is also highly creative, and has a diverse range of interests. "This project is a dream... the vineyards, the location, the winery and the vision. (This is) the most exciting project in the world of wine that I know of"
Kurt is the closest thing to a grape whisperer that we've seen. A native of New Zealand, he shares the passion for the soil and detail obsessiveness with Shane – the two were in synch from the first day they met. Kurt has had a long and specialized career in farming and nurturing organic grapes for premium wines, particularly super high end Pinot Noir. He believes in a single vine approach to viticulture: paying attention to every single last detail of every single vine in order to grow the very best possible grapes. He believes that the vines should be grown naturally, respecting the land and the variability that each season brings. Kurt has been developing and farming vineyards for decades. For the last 10 years, all of his work has been with organic properties. "I'm stoked to be working in such a stunning place. There is really no where like it." American Tom Kundig is a rock star in architecture. He's bold, creative and sets trends across many fields. He's won pretty much every award in his field, and his work has featured in publications from the Times (NY), to the Financial Times (UK), and the Wall Street Journal. He's on the Architectural Digest AD100, and Wallpaper*150 : an individual who inspires the way we live, work and travel. One of Tom's passions is mountaineering, which strongly influences him. Landscape looms large in his work, as does risk-taking. He opts for tough and rustic materials that evoke nature and weather over time. "Martin's Lane... where inspiration was made possible by the incomparable and intense landscape and the abundant rough, natural materials." Bold. Creative. Relentless. Anthony von Mandl is a visionary with a deep appreciation for beauty, art and whimsy. When no one knew where it was or how to pronounce it, he recognised the potential for British Columbia's Okanagan Valley to emerge as a world-class wine producing region. He has spent his life making it so. Unconstrained. Anthony von Mandl conducted a global search to assemble a diverse team of experts to help build the most radical pinot noir winery. From New Zealand to Italy, Germany to Oregon, Washington to Spain, France to California, each expert in his/her field was selected to realize the creation and construction of this vision. The six-level gravity winery, carved and hidden within the steep, striking landscape is the result of these collaborations. Hand harvested fruit from individual vineyard selections are transferred into cool rooms. Every grape is meticulously hand sorted and falls gently into small fermenters. Carefully selected and sorted parcels are spontaneously fermented in small, mobile fermenters. Traditional Concrete vessels naturally regulate fermentation and refine the tannin structure. Pinot Noirs briefly settle here before transfer to the barrels in the cellar below. Direct from the press, free run riesling juice flows beneath the winery and fills these vessels by gravity prior to fermentation. The final resting place prior to bottling. The wines harmonise here for up to one month before bottling. Finally. All wines are gently bottled by gravity completing the life of the wine in our 100% gravity winery. All barrels are filled by gravity. Here they rest, unhindered for about 16 months. All French oak, all tight-grained. Climate controlled in the perfect environment. I like to wander the three tiny estate vineyards every morning to get to know and check on the individual blocs. Kurt and I will often do this together. I take a micro view of the vineyard and think about wines right down to the single block or vine. I consider my winemaking approach gentle and guiding. We use gravity alone, and five simple movements in our 6-level winery. Our wines are tended, harvested and crafted by hand. We don't interfere. We don't use a single pump. We believe this brings out elegant and complex expressions of Pinot Noir and Riesling. "I see my challenge as harvesting the amazing light, and allowing each bottle to represent pure nature"
"Our wines capture each vineyard's unique and distinct geology, aspect, elevation and micro-climate amplifying the subtle differences of each site in a way that is unmatched in the Valley." Many of our wines are expected to sell out quickly. By joining our list, you will be first to receive our release offers. Our winery is not open to the public, however we will occasionally open to small groups with advanced booking, so please make a tasting appointment request. Raw. Rugged. Fractured. With its sun-scorched earth and jagged rocky hillsides, this is a place where the elements reign. The building is an expression of the raw, exposed environment, using materials designed to weather, age and reflect the natural roughness and beauty. The building's form is conceived as a fracture down the middle opening the interior spaces to daylight while one side follows the slope down the hillside, and the other follows the horizon. The Pinot Noir grape is the result of a remarkable series of genetic mutations that have evolved over generations. Anthony von Mandl was intrigued by the interesting coincidence that both pinot noir and redheaded humans, another genetic mutation, both represent only approximately 1.9% of their respective populations. He commissioned artist and cultural icon Douglas Coupland to create a sculptural project entitled ‘Redhead', to celebrate the opening of Martin's Lane. The project involved a global search for the man who most resembles Vincent Van Gogh, followed by the creation of... Vincent.